One Step Behind” is the UK’s Premier and longest surviving MADNESS tribute band. Formed in spring 1993, the band achieved widespread recognition in an unusually short time, playing venues the length and breath of Britain including the Marquee Club in London & the Venue in New Cross. Jaunts into Europe and beyond are also common place. Members of Madness have joined the One Step boys on stage on …a number of occasions. Sax player Lee Thompson has played a few times commenting the band were “Tight as a ducks arse” and “Brilliant”. Lee is also quoted as saying that OSB were “single handily keeping the good ship Madness afloat”. Drummer Dan “Woody” Woodgate joined the band on stage for “One Step Beyond” and told the boys he thought they were amazing. “That’s exactly what we used to be like – you’ve got it to a tee!” he said. Fine praise indeed! And he could not believe the keyboard playing used no overdubs and was all being played live! Perhaps the greatest tribute came from Suggs himself. At a gig at G-MEX in Manchester walked up to the microphone and said “By the way, we’re MADNESS not One Step Behind! !” The subsequent review in the Melody Maker bared the headline “One Step Behind”. Fine praise indeed! One Step Behind has also appeared on television a number of times. Singer Ian Soulsby made an appearance on “Stars In Their Eyes” in the 1990s while the whole band appeared on children’s Saturday morning show SMTV (with Ant & Dec!) in 1998 performing their version of “Driving In My Car”. OSB also featured on the “Tribute Band Night” programme, filmed in Rotterdam and broadcast on Dutch TV in 2004 (see video clip). OSB’s most recent TV appearance was at the 2006 Proms party in Hyde Park, London. The band performed to around 50,000 people and a television audience in the millions! 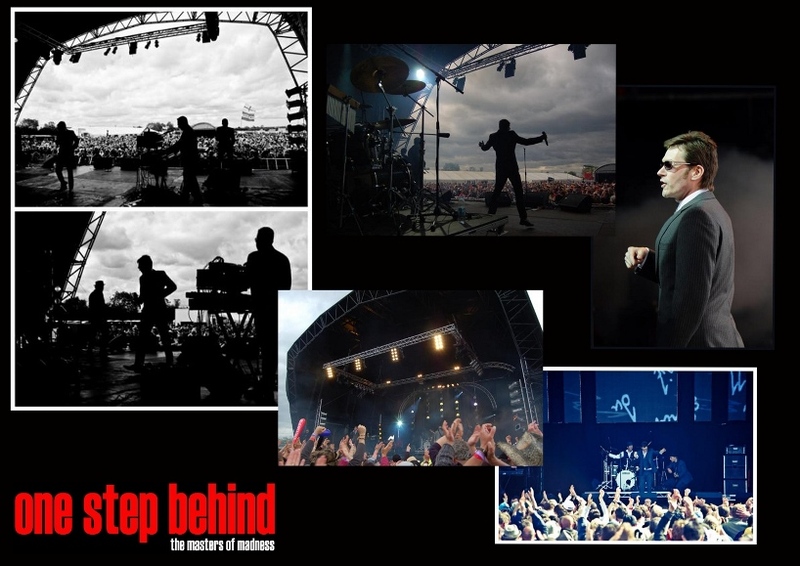 Each member of One Step Behind grew up as a Madness fan and perfecting his portrayal of his original Madness counterpart has been a labour of love. They strive to match every detail of the original, both musically and in appearance. Like Madness, One Step Behind is well known for their on-stage antics with which they build up an authentic ‘Nutty’ atmosphere. This is One Step Behind’s philosophy – to carry forward the mad mantle into the 21st Century and beyond.